US, 1959, 161 minutes, Black and white. James Stewart, Lee Remick, Ben Gazzara. Arthur O Connell, George C. Scott, Eve Arden, Kathryn Grant, Duke Ellington, Joseph N. Welch. 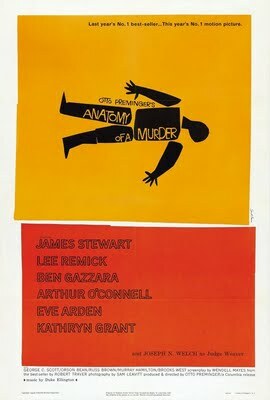 Anatomy of a Murder is quite an interesting court-room drama. Probably somewhat sensational on its first release, it certainly seems less so now. What the film gives is an arresting presentation of the defence of a man charged with murder and the use and abuse of the truth. The processes of American justice and court proceedings are looked at, their value appreciated, but the question raised as to what can be discovered about the truth by a court and how this affects people's lives. A similar kind of theme was explored in Sidney J. Furie's The Lawyer. James Stewart lends his respectable presence to the film. On the other hand, this: film was an early one in the careers of Lee Remick and Ben Gazzara, as well as of George C. Scott who gives a good supporting performance as the prosecuting counsel. Otto Preminger generally goes for big and frequently booming movies like The Cardinal, Exodus, In Harm's Way. Here his film is big, and worthwhile. 1. What did the title, and the credits background lead one to expect from this film? Were expectations fulfilled? 2. The jazz score was very distinctive, and Duke Ellington appeared in the film, What did the score contribute to the film? 3. How typical a James Stewart cinema character was his Paul Biegler? How did James Stewart's presence in the film give it a distinct flavour? 4. What image of American justice and American goodness did the character of Paul Biegler, plus his friendship for and wise-cracks with alcoholic Emmett Parnell McCarthy? and secretary, Marda, offer? Is this now a dated image or is it still valid? 5. Why was the Mannion case important to Biegler? Was this a driving force in the film itself? 6. The presentation of law and order in the film, its necessity, its processes, its shortcomings? How well did the film show that legal justice is not to be equated with moral right and wrong? 7. How interesting was the reconstruction of the case - its insight into the way a lawyer works (especially from the point of view he has to adopt to prosecute or to defend)? How did the reconstruction of the case show how difficult it is to remember exactly what happened, to find the truth? 8. The Mannions - as characters; their marriage, quarrels, their qualities as persons; Frank Mannion as brutal and Laura as self-centred and seductive? Even if they were not sympathetic characters, weren't they entitled to the protection of the law? Dissociative reaction, irresistible impulse. 9. Barney Quill's place - first impressions (especially Alphonse Paquet and his hostility and the ambiguous role of Mary Pallant); how wrong can first impressions be when they are shown up by the truth? 10. The impact of the court scenes - why are they always interesting? Why was this court scene impressive - the cross-examination of the witnesses (and the manipulating of witnesses - e.g. Laura herself in glasses and prim and proper), the verbal fire and interchanges, the gradual revealing of truth and of prejudices, the varying styles of acting by Stewart and George C. Scott? Did the screenplay overload favour for Paul Biegler? 11. The end and the irony of Mannion's acquittal and running off? What comment did this make on the value of the trial?